E.B. White was a great comic novelist. In working on this piece I read his trilogy of fantasy animals twice, and came away with the conviction that these are comic masterpieces. They are of course fantasy novels, in which animals talk and write. The fantasy world of these novels belongs within the genre of comedy. Re-reading E.B. White's trilogy was like the experience I had when our local arts cinema in Aberdeen had a season of Jaques Tati movies. I had seen them all individually, but now I saw them all again, serially, over a few months. The total experience was one of uplift - the natural equivalent of grace. I felt something similar in my re-immersion in White's comic-fantasy world. It is a world which steeps the reader in a kind of 'natural grace'. I dare say some reader will point out that 'natural grace' is a contradiction in terms but I shall be on my way to Santiago of Compostella and unable to return fire. Stuart Little is the first of the three, published in 1945. Of the three, this one is the least of a 'children's book'. Now, I know that someone could say that any good children's book is equally a children's book and an adult's book: it is simply a good book a child could read too. In fact, someone did say that to me, and perhaps she is right. But to me, Stuart Little comes across as a pure joke. The joke is that Mrs. Little gives birth to a mouse, who from birth has the habits and demeanour of a man. This is taken with absolute seriousness, and there is no attempt at all to get the reader affectively to empathize with Stuart and his diminutive condition. There is no 'emotion' in this book. Stuart is depicted with rather a cold eye. There's no warmth here, in the way that we see warmth in Charlotte's Web. The Little family, Stuart's parents and older brother George are depicted as ineffective in their efforts to accommodate a mouse as family member. They cheerfully use Stuart's size to their advantage, sending him down drains, and using him to rescue ping-pong balls. Stuart's mother cries for him, but Stuart is never really a member of the family. And that is exactly how it would be, if a woman gave birth to a mouse. This is part of the greatness of E.B.White's comic imagination. On the one hand, the greatest extremes of lyrical fantasy. But on the other hand and simultaneously, there is a stoical realism about human nature and its foibles. On my first re-reading of Charlotte's Web, I was disappointed in Fern. Fern is the little girl who saves Wilbur the pig's life by refusing to allow her father, Mr. Arable, to take an axe to the runt. She raises him. And then, in Wilbur's very moment of triumph, at the end of the book, when he is given the Fairground medal which saves his life, Fern has lost interest. She has gone to the Ferris Wheel with a boy. Fern has grown up over the book, growing out of her love for the farmyard animals amongst whom she once sat for hours. A boy, Henry Furry, is now more interesting to her than Wilbur. On re-reading the book, I realized that this is E.B. White's great realism at work: the way of the world is that Fern will grow up, and take more interest in humans, and human love, than in animals. Anything else would have been a dreadful fate for the girl. Imagine a 40-year-old Fern Arable, still sitting around the pig pen! And so it is throughout Charlotte's Web. It is a much more affective and in some ways a more sentimental book than Stuart Little. Surely most of its readers simply do not want Wilbur the pig to die, and recall it as the tale of a pig's triumph over being made into bacon. But the truth is that Charlotte, who saves Wilbur, dies on the night after her protege's triumph. Spiders live only a short while, and the book remains true to this fact of life. The book describes Charlotte, dying alone, in the fairground, after everyone else has gone home. Nothing else could have happened. The pig could not have resisted being forced into his box and driven back to the farm. That is the way animals live, and for all their talking and writing, E.B. White sticks with the laws of animal life. One of the most refreshing aspects of Charlotte's Web and The Trumpet of the Swan is their depictions of the natural life of the seasons. Stuart Little is a kind of comic version of the Blue Flower. It ends as Stuart begins his journey in search of a bird whom he has loved and who is now clearly unobtainable. Nonetheless Stuart sets out boldly in quest of the unattainable. Charlotte's Web is about a spider saving Wilbur the pig's life by making the farmers think HE is miraculous by weaving praise of him in her web. The true miracle, that a spider can write 'radiant' in her web, goes unnoticed. The Trumpet of the Swan is the last and funniest of the three books. The funniest character is Louis' father. The cob is a great idealist. He steals a trumpet for his mute son Louis and yearns to repay his debt to the music store and restore his honour. He gives grandiloquent speeches, thus creating the opportunity for take-downs by his wife. My favourite is when the cob says 'I glide swanlike' and his wife snaps 'You are not likely to glide mooselike'. No comic hero ever smiles, or laughs or apparently sees the joke of himself. That is why animals make perfect comic heroes: it is entirely realistic for neither Stuart nor the cob nor Louis to recognize how funny their aspirations are. ...as the course goes on, the movement becomes centrifugal; we rejoice in our abandon and are never so full of the sense of accomplishment as when we have struck some bulwark of our culture a deadly blow. —Frank Zappa, "Trouble Every Day"
I watched this noir classic for the second time recently--the first time was probably more than five years ago--and immediately pronounced it the best of its kind. On reflection, I thought I might back off from that, as I considered others like The Maltese Falcon and The Postman Always Rings Twice. But I won't back off very far; it's as good as those, at least. I like it considerably better than Double Indemnity, which is another that's usually judged to be near the top of its class. One reason is that I find Robert Mitchum and Jane Greer more appealing than Fred McMurray and Barbra Stanwyck. Another is that the cinematography is top-notch. Many films of that period (late 1940s) are dim and muddy, but this one is crystal clear. And to my taste it's a more powerful story. Josef Škvorecký is perhaps not a famous author (or perhaps he is and I've just missed it). In any case, he died in 2012 and his works are not now easy to find in English in Europe. He was a Czech dissident who went into exile in 1968, after the Prague Spring, and got a job teaching American Literature at the University of Toronto. Alongside his day job, he was a comic novelist in Czech, many of whose works were readily available in English translation in the 1990s, when I carelessly assumed they always would be. Twenty years on, they seem (with one exception) to have passed out of print. Had I anticipated this, I would not so lightly have lent out or given away the paperbacks I had bought. Those of his works I have read fall into three categories: historical novels, detective fiction, and semi-autobiographical novels. In the last category, the author's alter ego is jazz-loving Danny Smiricky, but the stories also incorporate lightly fictionalised events from Czech history, which the author did not himself witness. The first of them is The Cowards (which does appear to be in print, in a 2010 Penguin edition), set at the end of the Second World War, with Danny a schoolboy in a jazz band (officially a folk band, jazz being musica non grata); it was banned on publication in Czech in the 1950s, and translated into English in 1970. This is followed by the more straight-forwardly autobiographical The Engineer of Human Souls, set in the aftermath of the Prague Spring; and by The Miracle Game, which centres on a fictionalised version of the 1949 Cihost Miracle, and the reopening of the investigation into it in 1968. The historical novels are The Bride of Texas, based on accounts of Bohemians who served in the American Civil War (a dense work that I tried to read but found surprisingly tedious), and Dvorak in Love, about musical culture in New York during the years when Dvorak was working there and wrote his New World Symphony (which is very funny). The man took off his hat and an unruly tuft of hair stood up on his round head. He was Lieutenant Josef Boruvka and with him was his 17-year-old daughter Zuzana. His present plight was due to Zuzana's lust for foreign fields. In order to turn this desire to educational advantage, he had promised that if her school report turned out well they would spend a holiday together in Italy. He had however committed a fateful error, for he had neglected to define the term "turn out well". Consequently, after a hard struggle with his wife and daughter, he had been compelled to keep his promise although the report had comprised an abundance of Cs. ... Lieutenant Boruvka took himself off gloomily to the Cedok travel agency. There had been a time when he too longed — in vain, such was the nature of the time — for foreign lands. Now, however, he had reached the age when a comfortable armchair in front of the goggle box was more attractive. Visualising lumpy beds in cheap hotels, and other hardships of foreign travel, he strode through the Prague streets in summer bloom, mentally calculating the amount that would be left in the family savings book after he had paid the cost of Zuzana's academic success. At the bottom of his heart he hoped that the foreign currency quota for the year would already have been exhausted. But the highest hopes are wont to be dashed. The holiday in Italy, like so many in detective fiction, turns out to be a busman's holiday for the Czech homicide detective. With great effort the old detective turned his attention from his private thoughts back to objective reality and said, "It's your neighbour. He's been murdered. And...," he lowered his whisper until it was scarcely audible, "I have reason to suspect — in fact I'm practically certain — that he worked for ... for the organisation that I don't belong to. There was a bugging device in his flat. He was probably listening to what you were saying here when ..."
"No matter," said the writer calmly. "There's already a microphone over there in the radiator and another one in the telephone." The lieutenant was visibly shaken and the writer slapped himself on the forehead. "Oh Christ!" He lowered his voice to a whisper even less audible than the lieutenant's. "A thousand pardons. I guess they haven't got you on tape yet have they? The last thing I want to do is get you in trouble...."
He got up, took the phone off the hook, and tossed a thick blanket over the radiator. The lieutenant's knees began to tremble. They drove past wheat fields golden in the daytime, the colour of old gold now, at night, waving in the night breeze beneath the cherry trees that lined the road. They drove through woods where the black shadows of magnificent owls flitted among the trees. A moth landed on the lieutenant's nose, then flew away; the sergeant, hunched over the wheel of the Volga, pushed the motor to the limit and the lieutenant's loaded pistol dug into his hip. The countryside sped by the open windows, redolent of barns and manure piles, villages submerged in darkness and silence, a landscape of clover and lucerne, the lieutenant's landscape, with ponds reflecting a twisted moon, like the crumpled collages of one of those artists from the Dubcek era who later committed suicide — an ordinary suicide from an era of normalization. A landscape of fireflies and old, ancient history, a countryside where criminals were drawn and quartered at a time when the city of Memphis no longer existed and did not yet exist. The afternoon before writing this I spent quizzing my oldest son in preparation for his school-leaving History exam, which covers the world since 1945. He didn't know the difference between the Prague Spring and the Velvet Revolution, and I felt very sad. As a historian I am wary of fiction as a gateway to historical understanding (I grit my teeth when I see novels recommended to homeschoolers as part of their History curriculum), but Škvorecký's writing certainly gave me a more sympathetic understanding of what it was like to live in the Eastern Bloc, and my first, hopeless, wish this afternoon was that I had encouraged my son to read Škvorecký months ago, so that he would have some imaginative and emotional hook for knowledge that to me seems so important. I don't even want to read the dadblamed thing. He was a male. A white male, of course. I'm always a puzzled and often disdainful of white men who have so internalized the left-wing and feminist attack on them that they seem willing to commit something close to cultural suicide. Around the same time that I read that professor's remark, I had a conversation with a young man of literary inclinations in which he acquiesced to the cultural judgment against his kind. He was a recruiter in the admissions office. Chatting with him one day, I learned that he had been pursing a graduate degree in literature, but had given it up for various good reasons--the dismal job market, and so forth. Then he paused, and added "Anyway, that's not a good place for a white male to be these days." And after another pause: "And that's ok."
I don't know what reaction I exhibited, but I distinctly remember what I felt: disgust. And what I thought: where's your manhood? Now that was an odd thing for me to think, because I'm distinctly lacking in machismo. But this is too unmanly--or, never mind gender, too deficient in elemental self-respect. To welcome to the study of literature, or anything else, those who have been unwelcome or excluded is a good thing. To snivel and abase oneself and cry "unclean! unworthy!" because of one's gender and ancestry is contemptible. Western culture--the "white male" heritage--is one of the finest achievements of the human race. To make its defects its whole is both stupid and dishonest. To be a product of it, and to participate willingly in the effort to destroy it, is, again, contemptible. You can read the whole thing here, though I wouldn't recommend it. My first question about this was whether it was a joke or not. As far as I can tell it is not. My second question was whether his sad condition is more his own fault or the fault of the educational and social environment which produced him. I suspect that the world does not need his poems, but perhaps he really is a poet, in which case his spine will stiffen. I'd like to say that it surprises me to encounter this in an English teacher, but I'm not that naive. The past...should not be the sole province of those who would go back in time: It can also be a very powerful resource for those with progressive hopes for the future, supposing they do more than dismiss it out of hand. The dreary title of the piece pretty much sums it up: "The Progressive Case for Teaching Shakespeare". You wonder if these people ever have any thoughts that don't involve politics. But in the case of Breunig, we know that she does. You may recognize her name. She appeared on the punditry scene a couple of years ago. Seemingly overnight, her writing appeared all over the place. She attracted a lot of enthusiastic attention in Catholic circles, especially in leftist Catholic circles: she is a young convert, obviously very bright, and very much on the left politically. That's okay; we certainly have plenty of Catholic voices on the right, and it's good to have the balance. And she does write about things other than politics sometimes, as you can see at her web site. But she seems gripped by the left-wing impulse to make politics everything, and everything political. Maybe she'll grow out of it. I love reading children’s books. I loved them when I was eight and could walk to the library whenever I wanted, and I loved them even more, I think, when I read them to my children, or before giving them to my children. Sometimes I still read them, even though all my children are grown and married. When I was young, I loved to read books about children from other cultures—to be able to enter other worlds. Diversity, of course, is one of the buzzwords of the day. It is constantly urged on us by the powers that be, and it feels forced. But at that time it was perfectly natural. I wasn’t reading books about different cultures because of a perceived need to be inclusive, but because the books were good and I was captivated by the characters and their lives. After reading Grumpy’s post on Laura Ingalls Wilder, I thought that I would follow up with a post about two authors from different cultures whose books might be called the Catholic Little House books and the Jewish Little House books. The latter were probably my favorite books when I was about nine, but I only found the former after I had begun homeschooling my children. I originally intended to write about both authors in this post, but as I see it’s getting fairly long, I think I’ll write about the second in a couple of months. Anne Pellowski was born in 1933 in Arcadia, Wisconsin, only 60 miles away from the Big Woods in Pepin County, Wisconsin where Laura Ingalls Wilder was born. Her great grandparents were the first settlers in the Latsch Valley where she lived. She is well-known for her books and workshops about storytelling, and was the founder and director of the Information Center on Children’s Cultures of the US Committee for UNICEF. She quit this position in the early 1980s to work on her writing and workshops. I first became acquainted with Ms. Pellowski’s Latch Valley Farm series in 1995 in In Review magazine, a small periodical about children’s literature published by Bethlehem Books. When I read in an article by Therese Ladell about this series featuring a family of Polish Catholic immigrants who were farming in a valley in Wisconsin, I couldn’t wait to get hold of the books for my youngest daughter. I think that I found them in the library, but it took me a long time to collect the 5-book series which was at that time out of print. Rather than follow one character as she grows up, Ms. Pellowski wrote stories about a year or two in the lives of four young girls in her family that span the years between 1876 and the 1960s. The earliest book in the series, though the fourth written, is First Farm in the Valley: Anna’s Story. Anna is the six year old daughter of Frank and Anna Pellowski, the first settler in the valley. She was about four years younger than Laura Ingalls Wilder and lived, as I mentioned earlier, only about 60 miles away from the Ingalls house in the Big Woods. There are, of course, similarities between Anna’s story and Laura’s. They lived on a farm and though they lived in a farmhouse, there is an old sod house where the family had first settled, and there is a chapter about a Fourth of July celebration that is very like the one in the Little House books, but there are many differences too. For one thing the family is more settled and prosperous than the Ingalls ever seemed to be. They are surrounded by a community of families who followed them into the valley, and Frank and Anna are very glad to have the other families there. Thirteen families would have been just about the thing to make young Pa Ingalls want to move. The Ingalls family had been living in the United States since the 17th century, but Frank and Anna Pellowski and their parents had recently left Poland to escape Prussian persecution. They still spoke Polish. Laura had two sisters, and a brother who died in infancy; Anna had three sisters and four brothers. The main difference between the Ingalls and the Pellowskis, though, was the difference between the Protestantism of the American frontier about which Grumpy has written in her post, and the Catholicism of the Pellowski family which is deeply woven into their daily lives. They, of course, go to Mass; they pray the Angelus; they fast during Lent and Advent. One of my favorite chapters, The Seeds Get Blessed, is in the second book (chronologically), Winding Valley Farm: Annie’s Story (Annie was Anne Pellowski’s mother.). The chapter is about Rogation Day when the farmers bring their seeds to church to have them blessed before planting. “Sancta Maria,” chanted Father Gara. Down the steps marched two altar boys, and behind them came the girls in their white dresses, the deacons, more altar boys, and then Father Gara. Row by row, the people filed out of the pews and joined in the procession, answering the priest in the chant of the litany. Around the outside of the church they went and up to the fields…. There they stopped and Father Gara sprinkled holy water in all directions, while everyone held up their seeds. Then they marched back to the church, singing a hymn in Polish. There is one tradition in the books that seems to clearly be some sort of pagan ritual that has taken on Christian trappings. During the traditional Christmas Eve dinner (described here), strangely costumed figures called gvjozdka come to the door and test the children to see if they deserve presents and if they pass, they might get a piece of candy or an orange. In the first book the gvojozdka are just wearing sheepskins, but in the second, they wear more outlandish costumes and are accompanied by a devil who tempts the children. Like the Little House books, the Latsch Valley books are not always cheerful. There is death here as there is in every life: a grandfather, a newborn baby, many children in a diphtheria epidemic. A schoolhouse burns; accidents happen; there are financial difficulties; but always the family and community pull together. There is one particularly poignant scene in Stairstep Farm: Anna Rose’s Story, which is set in the 1930s. Anna Rose’s grandfather has died and the family is gathered at his home for the wake. The children are quietly playing a kind of tag outside called Starlight, Moonlight! The Searchers are seeking the Ghosts. It was time for Anna Rose to be a Ghost again…. “Aren’t we too close to the house?” asked Anna Rose. From the open windows of the front room floated the hushed sound of voices, singing in a subdued way, as if they were holding back part of the song. Grandma Olszewski led each verse in her clear, sweet voice. The others would follow as soon as she gave them the first few words. On some verses, only the men sang, deep and low and mournful. When the women sang alone, it was soft and high and sad, too, but in a different way. We’re out to see the Ghosts tonight! Again and again they repeated it. The lively rhythm contrasted with the solemn, measured beat of the singers inside. The pungent scent of the ripening raspberries joined with the waves of music coming from both sides. Overhead sparkling stars of the warm August night made just enough light to cast shadows, but not enough to see things clearly. It was so mysterious and beautiful that Anna Rose did not want to play the game any more. She wanted to sit and listen and feel. I have been in many choirs in my life, and I have sat around many campfires singing, but I’ve never experienced a group of family and friends sitting around singing like this. I wish I had. This scene captures something—an atmosphere that seems to be gone from the world, or at least a large part of it--and it’s a great loss. As I was reading this third book, it seemed to me that Ms. Pellowski was being rather hard on Anna Rose. She seemed to judge the little girl’s actions more strictly than she had those of the girls in the two previous books. Then, I realized that Anna Rose was Ms. Pellowski, and that the reader sees more of Anna Rose’s inner life than he does of that of the other girls. The fourth and fifth books of the series, Willow Wind Farm: Betsy’s Story, and Betsy’s Up and Down Year, are set in the 1960s and are the story of Ms. Pellowski’s niece Betsy and Betsy’s brother and eight sisters. Sadly, we begin to see a bit of the dissolution of the '60s begin to creep in. There is less about the faith, and there is a rather mysterious chapter that implies that one of the girls took some pills from her grandmother. The father has to go to work to make ends meet, and the mother has to work in the fields. Then she has to go to work, too. The economy, the oikonomos of the family that we have been discussing is breaking down. While these books follow one another chronologically, they are the first and the last that were written, and the latter was written before the former. Despite the obvious cracks in the family armor, though, there is still much that is good in the Betsy books. Unfortunately, I didn’t get a chance to re-read them before writing so I can’t remember them clearly, but flipping through the books, I can tell that I will have to read them again. While I was looking up biographical information about Anne Pellowski, I found to my delight that she is still alive. I might write her if I can find out how to do so. The Bethlehem Books website (her current publisher) says that Frank Pellowski has over 800 living descendants. I wonder what they are all doing. During the course of writing this post, I also got information here and here. I read this book some months ago and have been meaning to mention it. A year or so ago (or was it two?) I read Wuthering Heights for the first time since college. I wrote about it briefly here--yes, it was only last year. Some time after that I ran across this book while browsing in the library and checked it out, mainly intending to get some idea of what those moors etc. looked like. It's a sort of pictorial biography of the Brontë family. The biography is brief, but if you don't know much about the Brontës, as I didn't, it's informative. And if you don't especially want to know all that much, as I also didn't, it's about the right amount. The pictures are a combination of modern and 19th century photos. Actually I suppose it's a book for people with a casual interest in the Brontës; real fans will already know all this, and have seen plenty of pictures. Anyway: it's out of print, but there seem to be plenty of inexpensive used copies around at places like Amazon and ABE, and at this UK dealer, to which I am linking because I lifted the image below from them. Gillian Allnutt is a contemporary English poet whose work I have admired for the better part of fifteen years. If someone asked me -- which, to date, nobody has -- to describe her poetry, the words that might come to mind are not mine, but Hopkins’: “counter, original, spare, strange.” Frankly, I’m a sucker for strangeness. I like idiosyncrasy. I like mystery. I like echoes that die away into white space. I like being taken to the edge of what I can understand, then asked to step out into what I don’t understand (without minding too much that I don’t). I don’t mind -- in fact, I sort of love -- not knowing exactly how things fit together, but trusting anyway that they do, somehow. It’s important to know this about me as a reader -- I guess. To some extent any reader of poetry has to be content with mystery, though some poems are more reticent in their epiphanies than others. Some poems make clear arguments, and some don’t. I tend to like ones that do, but love ones that don’t. In other words: degustibus &c. Given that I’m the kind of reader who wouldpraise the counter-original-spare-strange in poetry, let me proceed to do just that. But maybe you’d prefer to see for yourself what I mean. Here’s an example: a poem of Allnutt’s called “Elsbeth,” which appeared in a 2008 issue of the British poetry journal TheRialto. I chose it at random from an online search, but even pulled out of a hat, so to speak, it does very much the kinds of things that I’ve just described. Like many of Allnutt’s poems, “Elsbeth” is a persona poem. Via the poet’s accompanying note, we’re given to infer that the speaker is the daughter of the German painter Otto Modersohn, and that she’s addressing her stepmother, the rather more celebrated expressionist painter Paula Modersohn-Becker. 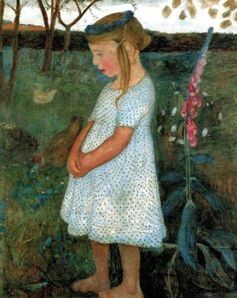 I believe this is the painting the poem references, though Modersohn-Becker painted Elsbeth several more times in 1902 (here, for example, and here). This helpful gloss locates us in a character, but also in an isolated moment like an inlet in an ongoing tide of narrative. What it’s possible to know, though you don’t have to know it all to read the poem, is that Otto Modersohn and Paula Becker were members of an artists’ colony at Worpswede, in northern Germany near Bremen, a flat, windswept, big-skyed place. They were contemporaries and friends of, among others, the poet Rainer Maria Rilke, who dedicated a poem to Paula on her death. Modersohn’s first wife had died in 1900, and the next year he was married to Paula. The marriage went unconsummated for many years, owing partly, it seems, to Paula’s wish to avoid motherhood, in order to devote herself to her art -- though she seems also to have been ambivalent about the marriage itself, and she and Modersohn lived apart for a number of years, he in Germany, she in Paris with another man. When Paula did at last return to her marriage and bear a child with Modersohn, it was at the cost of her own life. Her daughter Matilde was born in 1907, and less than three weeks later, Paula was dead of a post-partum embolism. None of this contextual information bears directly on Allnutt’s poem, except to emphasize the smallness of the moment it captures, and of the person who speaks it, over and past whom all these un-narrated events are pouring like a ferocious wind off the North Sea. For this speaker, the larger adult life with its tragedies belongs to the mystery, the white space, outside her own fragmentary words. On the edge of these life-and-death events, she is a bystander, largely forgotten by history and also, we might infer, by the very people who should have thought of her. But the poem has a logic -- for one thing, it has a form. Rhyme, if nothing else, holds its apparent randomness together. For all its openness on the page -- a line, two lines of white space, another line -- the poem has no formal loose ends. Everything in it rhymes with something; it forms a kind of eternity knot, nothing sticking out, nothing abandoned, nothing orphaned -- nothing, that is, except Elsbeth herself. On every level, the poem holds itself in tension: unmetered lines dropped like crumbs on the page, but ordered by rhyme; words venturing into silence, but not too far; a girl with no mother who speaks of her mother; a hatched saint like a bird and a rag, freed and discarded in two lines. In its spareness, it maintains a certain ascetical clarity. Elspeth, thinking of the saint whose name she can’t remember -- “Boris or Gleb or Basil” -- anticipates perhaps a similar fate for her own egg-soul: “It’s laid.” Like the saint, she may imagine emerging into freedom, or into forgottenness. Perhaps this is why she wants her soul to be painted, to fasten it to the world and preserve it there, to give her, Elsbeth, a place, a purpose, a “word . . . like a wheelbarrow handle.” The “cost” of life, like light, is “not inconsiderable” -- she’s aware that her father counts this cost. In the face of adult losses, betrayals, and self-absorptions, which must appear a great, blank, all-permeating mystery to a child, that child pleads for love, and more than love. She pleads to be allowed to exist and to matter, as much as a wheelbarrow handle exists and matters. We don’t have to know much about the person to whom she addresses this plea to find it poignant, though of course the more we do know, the more we can apprehend the weight of loss which her words, gnomic as they are, bear into the world. The poem itself, though, stands against her non-existence. It names her and gives her a voice, counter, original, spare, and strange. This is the general mode of Allnutt’s poetry: surfacing out of some larger, and largely unknown, story to grant readers a brief eccentric glimpse into an experience which for us may remain largely a matter of guesswork. To be honest, I can see how some readers might find this maddening. Sometimes I find it a little maddening myself. Her poems can be introspective and self-referential to the point of -- well, for example, the titular sequence in her book Nantucket and the Angel arises from a private narrative in which the Angel Gabriel appears to, and temporarily moves in with, an old woman named Nantucket, described on the back cover as “Gillian Allnutt’s imagined 90-year-old self.” Right, well, okay . . .
Isak Dinesen back in Denmark, living on oysters, champagne? With Nantucket it’s Guinness and milk. Polly put her onto it. Uh, if you say so. Here I ask myself, why do I buy this poem’s logic at all? What gives its assertions any purchase in my mind? Is something wrong with my mind, that these assertions do gain some purchase there? (I mean, again, whatever) -- the sounds themselves knit things up. Formal coherence is a level of coherence, and it forces even the most oddly assorted details to hang together. Even as I think I mean, again, whatever (a variation on the theme of right, well, okay), still I’m willing to trust the poem. I’m willing to accept even Polly, not knowing who she is. I’m willing to accept not only the imaginative world of the poem, but the imaginative world outside, in the white space that’s always pressing in on it. “Phoenix” isn’t my favorite Allnutt work, but like “Elsbeth” it’s a good illustration of what I love about her poems, even when I find them crazy-making. Perhaps it’s a sign of a credulous intellect, being too much dazzled by linguistic virtuosity and too ready to grant that there’s any sense beneath the surface of the words, or in the unrevealed narratives that inform them. On the other hand, this is one of the elemental things that sets off poetry from prose: that it hints at more, suggesting that whatever it does venture to say, far more goes unsaid. There’s more to the universe than what can be pinned down in language, and even that pinning-down is speculative at best. are flying in his heart. In my mind, this moment in the poem echoes the climax of Ruth Pitter’s poem “Morning Glory,” in which we penetrate to the golden heart of the flower to find an angel “crying Glory and hanging in the eye of the sun.” Here, too, we’ve penetrated to the heart of something sublime, though what we find is inarticulate. It doesn’t cry Glory; it just is glorious, even in its simplicity. At this moment, the human heart opens, like the cathedral roof, to the enormity of light and sky, the intimation, if not the declaration, of heaven. To say the poems are meditations is too obvious, except that it is worth saying because such writing is rare; one must say more than that, that the way here as a record in poetic form is unique and, for anyone who has read her poems over decades now, the patient development is of something earned by a kind of stealth... [W]hat is shared here is both beautiful and awkward, it cannot say and it goes some way towards saying. I suppose you could go too far in the pursuit of silence and mystery on the page. You could dismantle language too much, be so spare that you do away with everything counter, original, and strange. Certainly the poet who writes too little would be a rarity, if not an outright paradox. Still, it’s fascinating to observe what looks like a process of stripping-away -- of speculating, by way of a poetics, about what would happen if you just didn’t rebuild that tower. What if you left the hole; what if you widened it? How far could you widen it before the whole edifice collapsed, leaving nothing but everything: all the untold stories? That’s what seems to happen in “silt road”, another of the Rialto series that includes “Elsbeth.” In this poem, even the syntax is peeled down to its nouns: a house, a step, a place, a skep. They hang on the page as unfinished thoughts, half-formed questions whose answers, again, remain hidden. The poem’s lines are like something washed up -- the “silt” of the title suggests a flood -- broken, with its essential parts missing. Even here, though, a framework remains, however skeletal. Though the lines are fragmented, still they mostly rhyme. The house is abandoned; nothing rhymes with it. But everything else about it is joined to something else: step / skep, Barnack / brick. We’re not given to know whose it is. We’re not given to know any of its stories, though like archaeologists we might piece together some narrative out of these shards the poem offers without comment. All we know is that it stands; it retains its structure and so endures the pressure of all the unknowing which surrounds it on every side. Skeleton that it is, this house stands. We are part of a mystery, a splendid mystery within which we must attempt to orient ourselves if we are to have a sense of our own nature… I believe that there is a penumbra of ignorance and error and speculation that exceeds what might be called the known world by a very large factor indeed. I believe this penumbra is as beautiful in its own way as what I have called truth because it is the action of the human consciousness. It is most human and most beautiful because it wants to be more than consciousness; it wants to be truth. Or maybe I really can’t explain at all, except by way of analogy. The other morning, on vacation, I sat with my coffee on the deck of our borrowed house and watched the gray sound wrinkling under the overcast sky. I was thinking not about poetry, but about the sea: all the life it hides beneath its sliding skin. When you look at the water, you know that you’re looking at something not-empty, though from where you sit, emptyis how it looks. My mother came onto the deck. “I wish I could see some dolphins,” she said. A moment later, something disturbed the water: a wave’s edge against sunlight, or something solid? And then the sound was full of them. It was like watching falling stars: if you looked too hard in one place, you’d miss three someplace else. Out of those depths, they kept breaking and entering, fins and backs and sometimes tails, brief but real, like waves become suddenly flesh. They weren’t the whole sea. The whole sea hadn’t become dolphins. Mostly it was water, unreadable as ever. But these glimpses of solid life, reaching out of that reticent water: they sufficed. We could have watched them all day. —Sally Thomas is the author of two books of poems, Fallen Water and Brief Light. If you're interested, here's an article at Popular Mechanics that seems reasonable and plausible. The short answer is "yes". The slightly longer answer is that recycling may not be "worth it" by a short-term dollars-and-cents calculation--it may be a money loser--but that it clearly is worth it by a longer-term resource consumption calculation. I'm glad to see that Popular Mechanics still has articles about slightly goofy inventions like a knife that toasts bread as it cuts.